VI [[underline]](K)EYHOLE ELECTS OFFICERS[[end underline]] The purpose of this organization is to: 1. Open the door to opportunity via a. talking and advising high school minority students and pointing out to them that an education beyong high school is becoming increasingly necessary b. orientation achieved by bringing high school students to the University of Iowa and letting them take a first hand look at the University, and letting them draw their own conclusions as whether or not a University situation meets their ne needs as minority people. Last week Keyhole had elections with the following results: Chairman Sly Black Vice-Chairman Elisa Sanchez (c)omptroller Louis Mosoco Treasurer Larry Page Laison Ron Spruill Alfredda Griffeth Secretary Sherry Evans Corres. Secretary Bev Taylor More Chicanos are needed and wanted on this committe. If interested in obtaining more info about Keyhole, call any of the officers or ask for Elisa or Donna and the Chicano House. [[underline]]MALO[[end underline]] Is a new album put out on the Warner Brothers label. What is so special about it? It happens to be a really good album written by Jorge Santana (brother of Carlos) along with Arcelio Garcia Jr. Abel Zarate Pablo Tellez, Raul Rekow, Richard Kermode, Leo "Pepe" Rosales, Luis Gasca, Richard Spremich & Roy Murray. This has a Santana sound for you Santana lovers, but it is more Latino, very smooth. Look for it GET IT Police Kill Two Chicanos in New Mexico (Chicano Press Association) On Saturday, January 29, 1972 at about 12:50 a.m. Rito Canales, 29, and James Antonoi Cordova 29, members of the Albuquerque Black Berets, were shot to death by six city and state police at a construction site south of Albuquerque, New Mexico. Attempts have been made by the local authorities to discredit the Berets in the community with false charges of possessing firearms and drugs. The response to this has been one of greater respect for the Berets and almost complete distrust of the police story. The police say that they received an anonymous phone call to warn them that robbery of a dynamite bunker at the construction site would be attempted that Friday night. Police were armed w with high caliber scope rifles and shotguns. The police claim early Saturday morning, they saw two men attempting to break into the dynamite bunker. The police claim a gun was drawn by Rito, but a gun was never found--after he was killed with 6 bullet wounds and James with 9 wounds. The New Mexico District Attorney, Alexander Screese, has already declared the police murder "justifiable homicide". Several members of community organizations have formed a committee to investigate the murders. They are uncovering more new facts & questions which point to the probability that the murder of these 2 brothers was set up by state and local police. 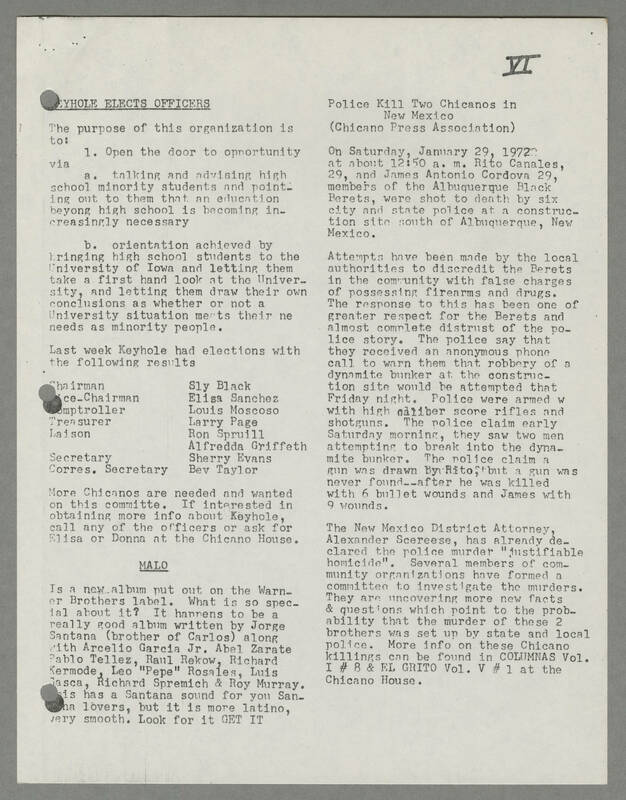 More info on these Chicano killings can be found in COLUMNAS Vol. I #8 & EL GRITO Vol. V #1 at the Chicano House.